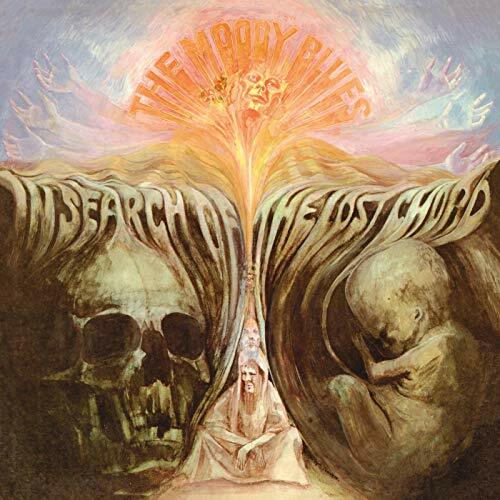 Released in July 1968, In Search of the Lost Chord is regarded by many to be the group’s masterpiece. A concept album, concerning itself with the spiritual and philosophical concerns of the psychedelic era, the group eschewed the use of an orchestra, opting instead for the Mellotron (played by keyboardist Mike Pinder) and other exotic instrumentation, with which they experimented and played themselves, including flute, sitar, tabla and cello. The Moody Blues have been at the forefront of the UK’s classic rock music scene for over forty years and have continued to be a mainstay of concert stages, recording studios and the airwaves to the present day. During their immensely successful career, they have sold, according to the band’s files, in excess of 70 million albums worldwide and have been the recipients of numerous prestigious awards. The deluxe format will be a 3CD/2DVD box set, featuring original and new stereo remixes of the album with bonus and unreleased tracks, including a never-before-heard mono version of Legend of a Mind. There are BBC Radio One John Peel ‘Top Gear’ and ‘Afternoon Pop Show’ sessions as well as mono mixes of the related Deram single A and B sides. DVD1 (Audio) contains In Search of the Lost Chord 96kHz/24-bit 5.1 Surround, new stereo mix and original stereo mix. DVD2 (Visual) comprises BBC TV ‘Colour Me Pop: In Search of the Lost Chord’ (14th September 1968); ‘Ce Soir On Danse: The Moody Blues’ – ORTF French TV (13th July 1968, previously unreleased) and ‘Carte d’Or’ – ORTF French TV (29th October 1968, previously unreleased). Also includes a 76-page book with extensive sleevenotes by compiler Mark Powell plus a host of rare photos and memorabilia images. Standard Vinyl – a 180-gram facsimile of the original LP with the original packaging. D2C Limited Edition Vinyl – psychedelic coloured vinyl with original packaging. This format will be exclusively available from the uDiscover store. 1CD – contains the new stereo mix plus bonus tracks.